It’s been a bit of a crazy week since I flew home from Alabama, and while I’ve been settling back into somewhat of a routine, some major changes have taken place. Reading Jessy’s post about getting unstuck and looking for the good side of life was really inspiring as I started off the week because, honestly, I didn’t have much to be thankful or grateful for. When I went to Alabama, I left a rather sick cat behind. Sheba, the oldest cat of the bunch (13 going on 14), has been in my life since I was 9. 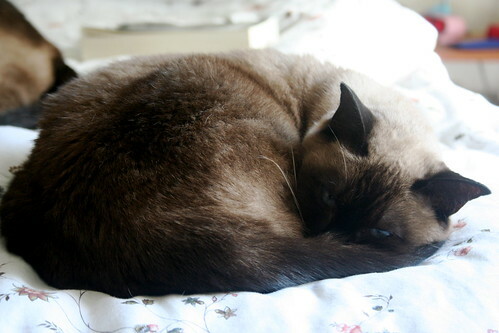 She was my cat, the one my mother let me pick out and name and carry from the breeder to the car, the cat who, when I start reading poetry aloud, curls up in my lap and purrs. While she never had the loudest personality, she was a cat who was always there, always loving, and always glaring at the camera. But her mouth had been deteriorating over the last few months, and with no money to spend on expensive surgeries, I just let it go as long as possible. When I got home, however, she’d lost at least two pounds (which is a lot for a small cat) and was in major pain. I hand fed her wet food, read her poetry, and spent as much time as I could with her before taking her to the vet. At the vet I learned she had a massive tumor under her tongue and there were no options. So, cradling her in my arms, I had to let her go. It’s one of the hardest things I’ve had to do, and, to be honest, I’ve never wanted someone to be with me more than then. It’s been quiet here lately, and a bit empty. But Mistoffelees and Dorian definitely pick up the slack–even though M. still looks a little confused with Sheba gone. It’s one of those times I wish we could really communicate with each other. But, on the good side, Sheba lived a good, full life and I truly believe we made each others’ lives a bit more wonderful. I miss the old girl, but I’m not sad to know she is no longer in pain. As good of a face as she put on, I know it couldn’t have been easy with a mouth tumor and I only wish I’d known about it sooner. On the other good sides of things, I am in the hiring process for the city of Roanoke public schools. Come February I’m going to be a substitute teacher! While it might not seem like the best job (I’m sure it’s going to be hell)–I mean, didn’t we all try to make our substitute teachers’ lives awful?? ?–I’m excited to see how teaching is with middle school and high school students, especially as I try to decide what direction I’m going to take with further grad school or trying to find a job. Given the hecticness, I haven’t been cooking too much, just eating a lot of salads and frozen soup and chili, but yesterday I did manage to cook up a big pot of clean-out-the-pantry soup. It didn’t exactly clean out my pantry (that’d be impossible), but it is composed of ingredients found only in my pantry/fridge/freezer. 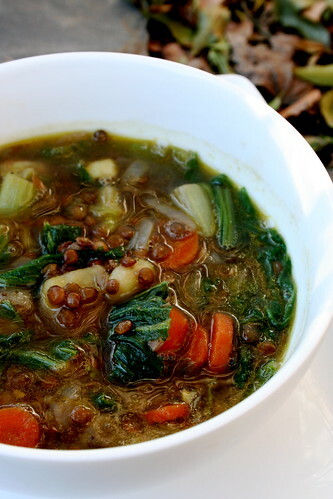 And the fun part is, I normally don’t like lentil soup–but I love this soup! It’s so simple, but so flavorful, and the green lentils give it a nice texture. Perfect for the wintry weather we’re all experiencing, I’d recommend a pantry soup like this–especially paired with cornbread or biscuits! In a large pot, saute the onions and carrots in the olive oil until tender. Add the garlic and sweet potato, and cook for 2 minutes more. Add the lentils, vegetable broth, and a dash of salt and pepper, and bring to a boil, then lower to a simmer. Cook for 1 hour, or until the lentils and vegetables are tender. Add salt and pepper as needed (I used about 2 tsp of salt total). Add the greens and cook for 3-5 minutes until tender. Serve with bread. Jes, so sorry for your loss. It sounds like sheba waited for you to return. Know that you gave her comfort. Good luck with subbing, it will be more fun then you think. Thanks for your wonderful posts. This sounds fantastic! I have almost all of these ingredients in the kitchen right this moment! I’m so sorry to hear about Sheba, I know how hard it is to lose a pet. However I am sure sure knew she was loved and it sounds like she had a life that many cats would envy, so don’t beat yourself up about the things you couldn’t have known about. Sheba was beautiful. I love that you read her poetry – that’s awesome. It’s hard to lose a childhood friend like her, but you were both lucky to have each other for as long as you did and she had a great life. I’m sure Mistoffelees and Dorian are doing their best to comfort you. Congratulations on the teaching gig – you’re very brave! Also, the colors in that soup picture are really enticing. Not that I need to be enticed to eat lentil soup; I’d eat it every day. I am so, so sorry to hear about Sheba. What a beautiful girl she was, and how lucky she was to have you in her life. A cat couldn’t ask for a more wonderful and caring guardian. I really am sorry. On a happier note – congratulations about teaching, this is really exciting. 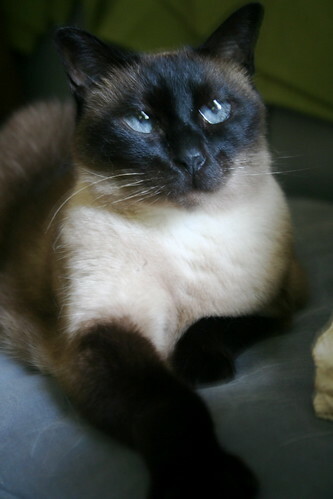 Sheba was such a beautiful kitty. Poor baby, I am sorry you had to let her go. What a long life she lived, and she was lucky to live with such a loving human. i’m so sorry, Jes. i’m sad to hear about Sheba, but happy knowing she had the most amazing life with you. almost 14 years of her life were spent being the happiest kitty – how blessed she was. congrats on you becoming a substitute teacher – such awesome news, my friend! middle and high school kids should be fun; you’ll have to tell us stories (and i look forward to reading them!). i’d love that. dan and i haven’t had a good clean-out-the-pantry soup in a while. yours is most inspiring (and looks so comforting and delicious.). we’ve got a lot of what your recipe calls for on hand, and i’m thinking a simple lentil soup is in the near future for us. many hugs are coming your way, Jes – and thank you for all your kind words. So sorry for your loss. It is a terrible grief! The soup looks awesome and I’ll be putting it to the test soon I’m sure! I’m definitely not a big fan of lentils, but oh my, your soup looks amazing! such beautiful colors! I am so sorry for your loss, Jes! I’m so sorry about the loss of such an important part of your family! Thinking good thoughts for *both* of you! Take care of yourself… hope things look up soon! I’m so sorry to read about the loss of Sheba. She looks like a beautiful girl who was a good companion. Gosh, my heart hurts for you, but I’m sure she had a great life with you – all 14 years. On another note, clean-out-the-pantry-fridge soup is a joy to make. Good luck with the teaching job, Jes! Give them life lessons to grow on. Best of luck with the teaching. I hope you find it to be rewarding. i’m sorry for your loss. my kitty when i was growing up used to love the violin. even when probably no human would have. i’m glad to have found this blog on a google search for ‘simple lentil soup’. this does look simple and tasty. i’m striving to eat a more vegan diet and this looks tasty and well balanced. i’m also trying to experiment with thermos cooking and will be trying to prepare this in a thermos. I almost thought you had posted a picture of my dear cat Billibob when I saw this. 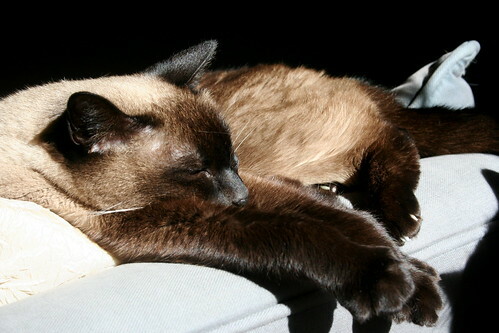 He is my angelboy…just something really special about him as it sounds like Sheba was also. He is now about 14 also. It sounds like Sheba had a good life with you, and is probably rolling around in catnip heaven right now…free of any pain. I started to look at the recipe, and then I saw the picture of Sheba.I forgot about the recipe because Sheba looked just like my Siamese Corky that brought with me to the States from Monaco. I loved her so much, and she lived to be 19. Losing her was one of the worst things in my life. She was born in 1965 and I have never forgotten, or stopped thinking about.She is now an angel, just like Sheba. Sheba was beautiful.